First Snow 4" x 4" Collage Card, originally uploaded by DianthusMoon. Today was my day to get some last minute things out of the way. I went to a produce place I found down in Delaware that has some excellent prices. I’m going to make some Rachael Ray garlic and chive mashed potatoes she recently made on her show. I needed some potatoes, turnips, sour cream, and Boursin cheese (which someone helped me find as I’ve never used it). I mailed off a few packages, looked around Tuesday Morning and found an adorable owl plaque for the garden (I have to fix a chip in his beak). 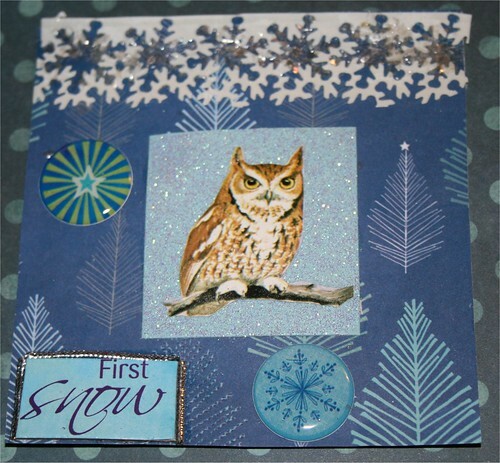 So the owl made me want to do an owl collage card as we have one or two that greet us at night also. It may be a screech owl like the guy on the card. I just bought some wintry scrapbook paper. When I was making this, I felt sick and had tummy issues. I was starving for dinner and Bri and I split a roast beef hoagie. I also had done 25 push-ups earlier in the day. Actually I used a roller machine you grab on to in the front and roll forward. I hope it’s not my HBP medicine. Brian said he hit a deer going about 40 MPH on the way home. He said one went in front of him and he didn’t have time to hesitate and hit the one following the first. He was pretty shook up when he came home. He looked at his car and it wasn’t dented. Maybe the deer ‘just’ got tossed to the side of the road. We had hit one years ago when Sean was a baby and dented the hood of a former car. I worry about the guys short cutting down back roads. I decided to return the Libre e-reader and get a Kindle that I really wanted to have for a few years now. The Libre wouldn’t download anything for me off of Borders. You can go there and download their reader and read books right off your computer. The Kindle has a ‘store’ right on the machine that you can visit and you pick and download the book (or newspaper) right away. A better choice I think! Today, the old Spectrum in Philly started to get demolished. I have been there quite a few times-saw a few Flyers games with a college friend and got Herb Brooks autograph (coach of the 1980s winning Olympic ice hockey team). Took Sean there to see ‘Disney on Ice’ a few times. Saw a number of concerts-John Denver, Dan Fogelberg, Jackson Browne, Linda Ronstadt and Heart there. Lots of memories. For some reason, I though you already owned a Kindle. That’s why I could not figure out what the gift was that Brian got you! Silly me.